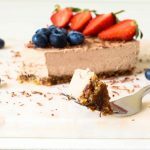 This raw chocolate cheesecake is gluten free, uses plant-based ingredients and is so delicious! I have always loved cheesecake so much that I tended to overindulge in its rich, creamy texture. This cheesecake was no different as we ate it within two days. This time I didn’t mind the overindulgence as this raw chocolate cheesecake is not too unhealthy compared to other cheesecakes. Topping it with fresh berries also allowed me to justify eating the whole damn thing! The main ingredient of the filling is cashews which is a great choice as it manages to replicate the crumbly texture of a baked cheesecake while also making it really smooth and creamy. The base consists of mainly dates and ground nuts (I used pecans) which gives the creamy filling a complimentary sweetness. I think next time I will use almonds or walnuts for the base as it might make the base more crumbly, which I prefer. I’m trying to incorporate more raw foods into my diet as I find that the recipes are easier, use more natural ingredients and are much easier to clean up after. My raw recipes board on Pinterest has all the raw recipes I love to create and share, check it out for some raw food inspiration. I think you’ll be surprised at how easy raw foods are to make. Add the dates, ground nuts, 2 tablespoons of coconut oil and vanilla essence to a food processor. Pulse until the mixture is thoroughly combined. The mixture should stick together when pressed between your fingers. Place base mixture in the fridge for 30 minutes to firm up. Just before you take it out grease a 9 inch spring-form pan. Place the mixture into the pan and press into a thin level surface. Thereafter place in the freezer for 15 minutes to firm up again. Add the cashews, coconut oil, coconut milk, agave nectar, vanilla extract and cocoa powder into your blender and blend until a very smooth consistency. Pour the filling over the base and, using a spatula, smooth over the surface of the cheesecake. Freeze the cheesecake for roughly 3 hours to fully set all the way through. Garnish with fresh berries and chocolate shavings. Are you confused about all those different health messages? Do you just want to find something that’s sustainable and really works? We’ve been there, too. Years of research and experimenting led us to a diet and lifestyle full of delicious meals that not only provided us with tons of energy but also eradicated all kinds of cravings and worries about our weight or health. With the help of plant-based foods, we said goodbye to crazy fads, digestive issues, and unwanted weight gain – and so can you! 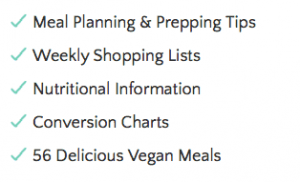 With the Vegan Starter Kit guiding you, you can expect an easy transition to and lasting success on a plant-based diet. Click on the image below to find out more. I am always looking for ideas for new toppings, so please leave any suggestions in the comments below. Follow us on Instagram for our latest recipes and tips for your plant based journey. This looks amazingly delicious! What other sweeteners could I use instead of agave nectar? You could use some stevia, maple syrup or date syrup – thanks for your comment Harry! This chocolate cheesecake looks really yummy and healthy too because it uses natural ingredients. I love cheesecakes and although I prefer New York style blueberry cheesecake, I would love to try this. I always like to experiment on new recipes but for the last couple of weeks I haven’t really had time because of my very hectic schedule but I will definitely find time for this, I have to. Cool thing, it’s printable! Oh by the way, does it really have to be coconut oil? I’m not sure I could find coconut oil here. And can this be prepared by baking instead of just freezing? I like baked cheesecakes as they are more firm. Thank you for this recipe and I will be looking around for more delicious and easy-to-prepare recipes. I am pretty sure you can substitute the coconut oil for another oil as long as it doesn’t have a taste, it should turn out fine. Unfortunately baking this cheesecake would only result in it melting! I am working on a baked cheesecake recipe and you just inspired me to make it a blueberry one, thanks Alice! I love the baked blueberry cheesecake too. This looks so amazingly tempting! Although I am not a big fan of coconut, I will try this out. It looks so irresistible!! As a matter of fact, I have also subscribed for your recipes and am now on your email list. I shall look forward to new recipes dropping into my mailbox. I am not rating the recipe yet as I haven’t tried it out – forgive me for that!! Thank you for subscribing Deepika! You’re the best <3 I hope the cheesecake comes out well! Johan, thanks for the great instructions. Love that your cheesecake is healthy (especially compared to other cheesecakes) and it really looks delicious! Certainly going to try these next week. 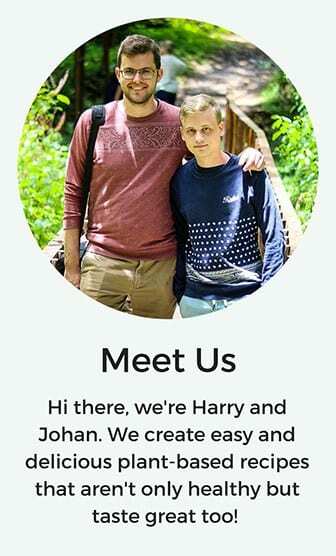 Oh Lord!, Johan why did I have to land on your website? My wife will kill me if she knows that I am reading this, as we have just started a diet. But I will still tell about it because she will love it, and I might be lucky to get away with it. Thanks for sharing. I wish you an awesome baking day! I’m so sorry John! Hopefully it doesn’t spoil your diet haha! Honestly, your comment just made my day – thank you for making me smile! I hope you get away with making it, will you let me know how it comes out? Have a great day John!